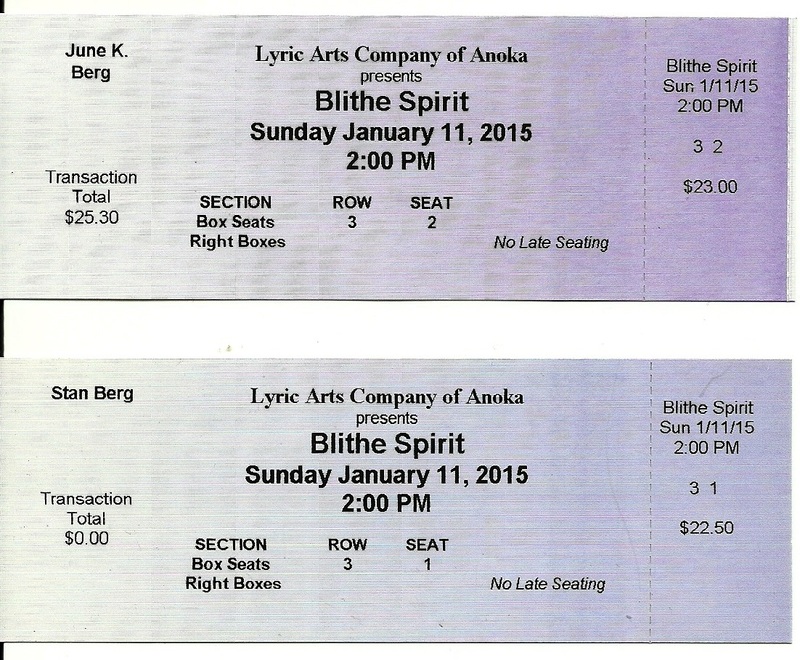 June and Stan were first introduced to the Lyric Arts Theater of Anoka in the year 2001. 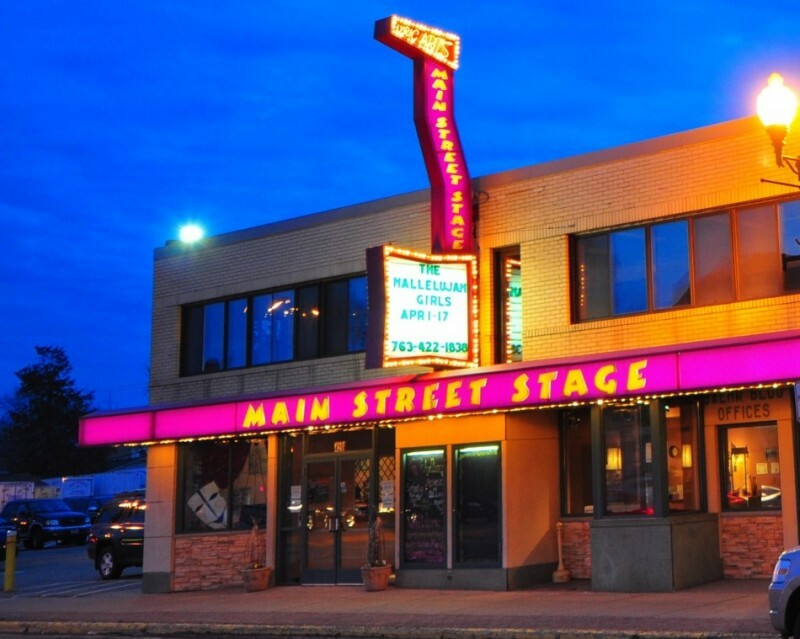 The Lyric Arts Theater was at that time in their early and beginning or formative years…The founder and the Executive Director was Lin Schmidt of Anoka...For June and Stan, the Lyric Arts Theater became a lifetime love affair. 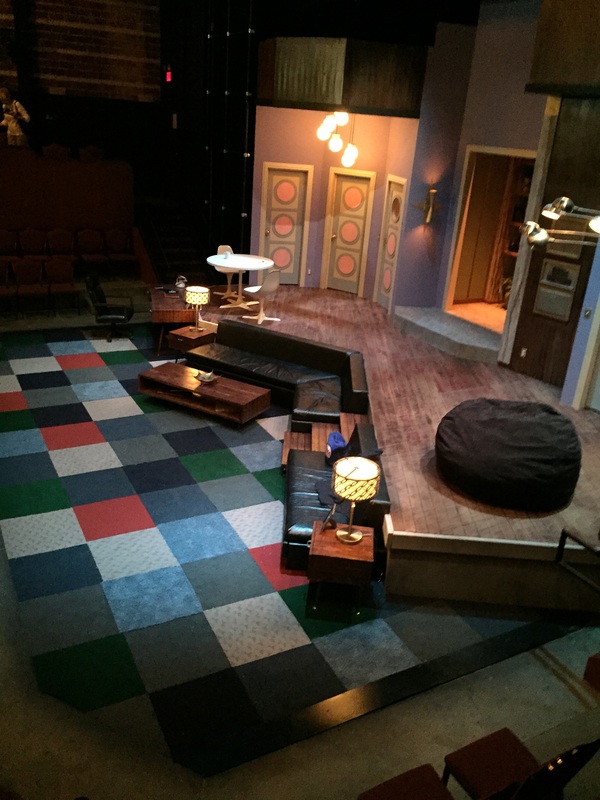 Life is full of causal and connecting links that in turn result in events and experiences that have lasting impacts on our lives…We were first introduced to the Lyric Arts Theater by way our friends Doralene Lekas and Leola Connery. These kindly and friendly Greek widow ladies were newly made friends from the Branson Christmas tour that June and I had participated in only a few months earlier in December of 2000. Thereafter, and using our initial Branson friendship as a springboard, we developed a fim and a lasting relationship that evolved into frequent and regular joint visits to the Lyric Arts Theater in Anoka…we made the most of the Sunday scheduled shows and productions of the Lyric Arts theater to foster and build that relationship and that friendship. 1. ”Joseph and the Amazing Technicolor Dream-Coat”…Feb 2-25, 2001. This was at the time of the World Trade Center terrorist attack…The theater debated whether they should do the show at this time of national tragedy. Photo Note: The Lyric Arts program shown above right was the oldest of 5 programs that June had saved in an old dresser drawer...June wrote the date of attendance in the upper right. (April 28th)...although June and I started attending in the year 2001, the only programs June saved were from the year 2002. 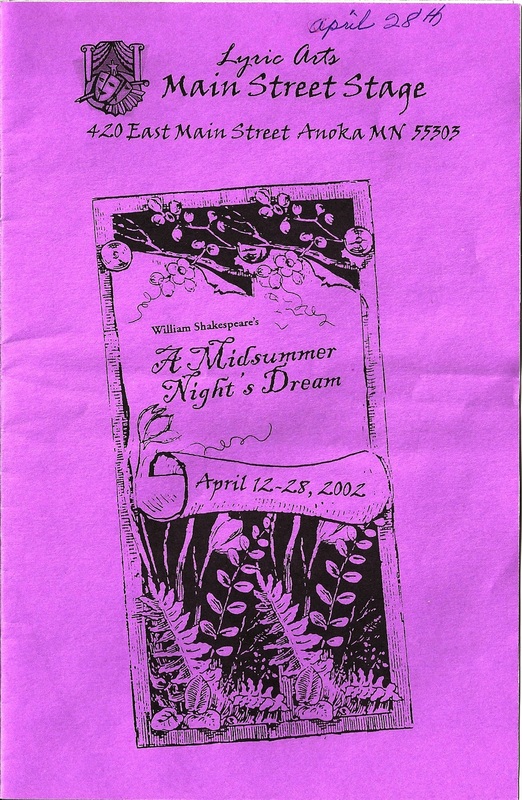 This one was from the production of Shakespeare's "A Midsummer Night's Dream"
One of the early shows/plays that June and I attended was "On Golden Pond". (Setember 2003) This was the story of a daughter and her father and their lake vacation home. It was also one of the adaptations of a very successful and popular film/moview by the same name...as a part of the story was the father's slow journey into the early stages of Alzheimer's...I recall being concerned about the possible negative impact or effect of this play on June who was also at that time on a similar journey into the shadows of Alzheimer's...June seemed to enjoy the play and none of my feared concerns appear to surface as a result of the performance. 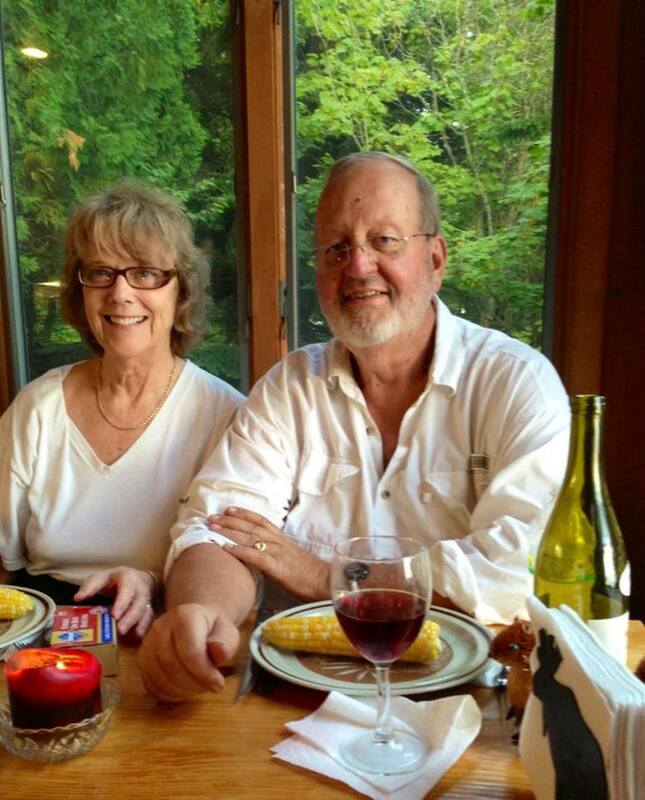 June and I have been blessed with great friends that allow us to continue our Lyric Arts Theater attendance together…thanks to Lin and Steve for their generosity! I am asking God in prayer to permit June to join me for the afternoon’s performance…a request for her to join me in spirit…while I have no way of determining if God grants this prayer request of not, it is my belief and my hope that he does..
Photo Notes: Top Center photo is the Lyric Arts Theater in Anoka, MN. 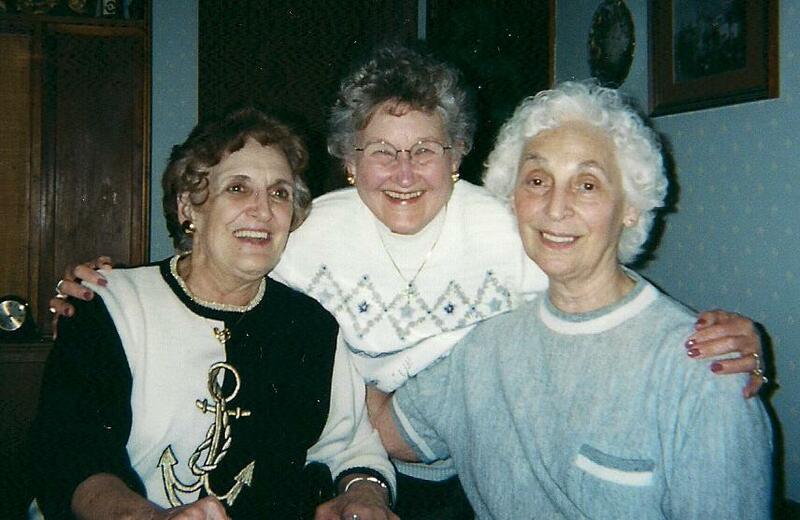 Top right photo is June with her new Branson friends (L-R) Leola Connery, June and Doralene Lekas...photo is at our home in March 2001, following a day at the Lyric.... Photo No. 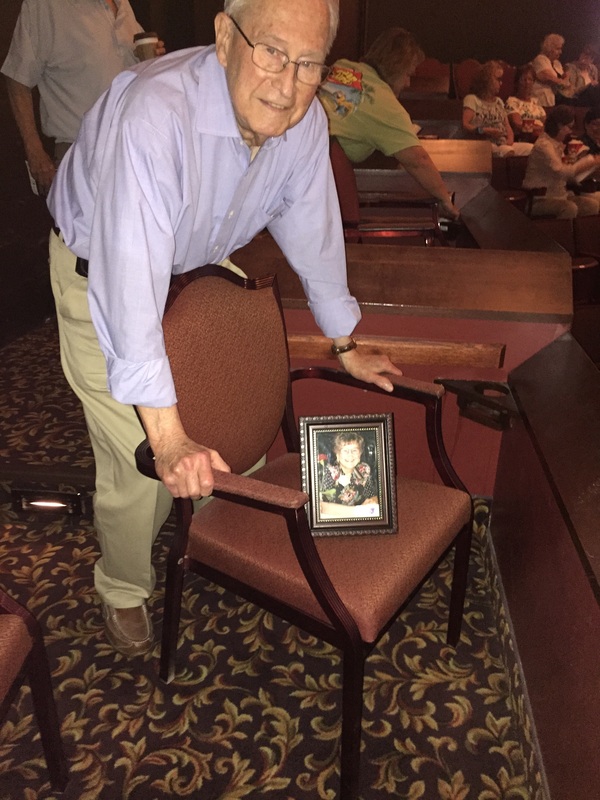 3. is June's framed picture seated on her own box seat No. 3-2 with Stan behind her chair. Taken on my birthday June 14, 2015 at the play Boeing Boeing. Photo No. 4 on right is June's view from box seat 3-2...stage set for Boeing Boeing. Photo No. 5 in lower right is Lyric Founder Lin Schmidt and her husband Steve....Bottom center...tickets for both June and Stan with Box 3 and seats 1 and 2. 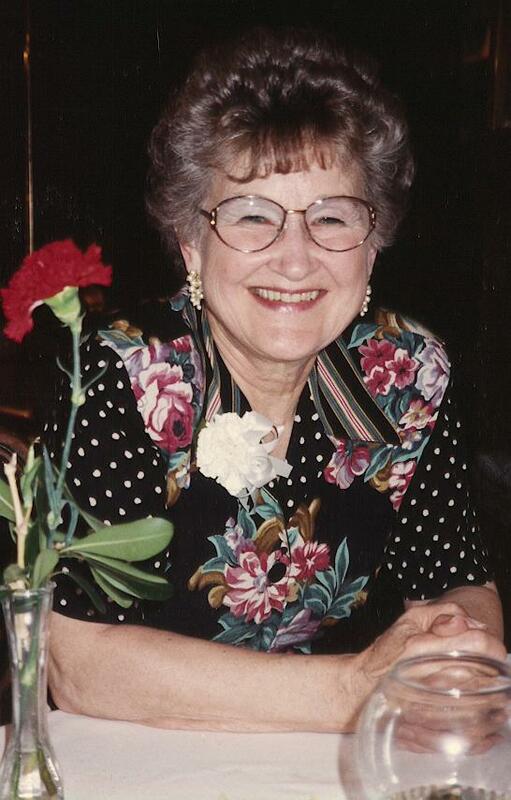 Bessie Peery - Nashville, Tennessee - (23 March 2015): "what a wonderful and Blessed...this is such an amazing story,...enjoy your posts, I know June is so proud of you as she looks down and sees all the good work...are doing for her. God Bless you on your journey, thanks so much for being a friend, also thanks to HTH for providing such a wonderful page that gives us so much joy." Helen Webster - Barnsley, United Kingdom - (2 July 2015):"I totally adore reading your posts I wish I could find that special one for me like June was for you." Toots Scudder - London, United Kingdom - (3 July 2015): "As usual Stanton, another wonderful story, and as always filled with love for your June." Janet Ashenden - Derby, United Kingdom - (3 July 2015):"...Thank you for another insight into your wonderful life with June." Jackie Irving - Liverpool, United Kingdom - (3 July 2015): "I enjoyed this story enormously Stanton...(15 September 2015):"Wonderful read Stan....you have a way of making your stories so interesting....I actually visualize your day as you write it...and June would definitely have been right there with you in spirit ...but then June is with you at all times in your heart ....take care and God bless Stan...(12 June 2016)...So glad you had a good time at the theater Stan .....I think I know the comedy you mean....the film version I loved...and I used to watch the sitcom with jack Klugman...I think it's so special that June is with you in the theater....what lovely people to issue June's ticket too...I've just read your link and as usual it was an enjoyable read...take care and God bless Stan." Vea Flood - Spring Hill, Florida - (26 July 2015):"What another wonderful story Stanton as I know she was with you during the show and always...thanks so much for sharing!!... had to go and wipe my eyes as it brought tears to them"
Tabatha Sturkie - Rock Hill, South Carolina - (13 September 2015):"Oh Stan, your most words that come straight from your heart and precious times spent with June always makes me smile. Thank you." Robin Stewart Stone - Charlotte, North Carolina - (14 September 2015): "I know exactly what you mean when you talk about June's spirit being with you. I feel that about my mother, that she's with me at certain times. I believe June is with you too. So happy about her seat beside yours. What a wonderful couple to give you such a gift. When you give your testimony, people who don't even know you want to pay for your meal, so I can understand someone that knows you wanting to do something special. There are just people that share themselves with you, and share their life story. You, sir, have a great story that most everyone would want to hear. I know I love every bit of it! Take care, Stan!"